There are too few boxing anime series out in the world and even fewer that can be found in North America. 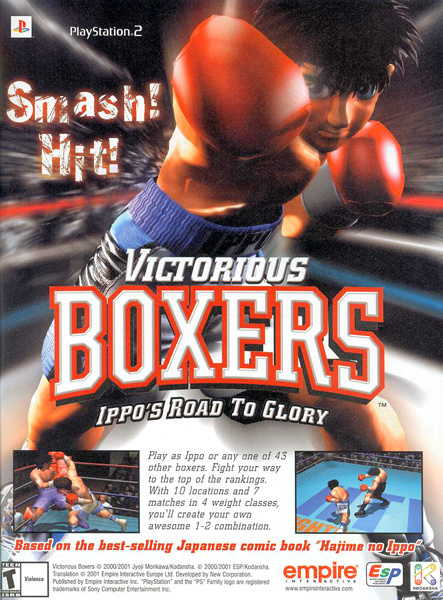 Geneon Entertainment, taking a sizable risk, picked up a series titled Hajime no Ippo whose only previous exposure to US fans was an under-the-radar PS2 title renamed Victorious Boxers: Ippo’s Road to Glory. Following the struggle of a nobody who works for his mom’s tiny fishing boat rental company, we watch Ippo train for three years, battling up the ranks to the Featherweight Championship. Fighting Spirit: Champion Road TV Special continues the journey as Ippo takes on his first challenger for the Featherweight belt he currently holds. Champion Road begins with Ippo’s title fight to originally win the Featherweight belt. 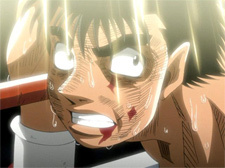 We watch Ippo’s sixth round comeback take him to victory over current champion Takeshi Sendo. Now, as a champ, Ippo’s world and attitude change only slightly as his friends and family try to get Ippo used to the idea of being a winner. A party with the usual boxing gang and Kumi at a karaoke bar lets everyone relax, but Coach Genji is already reminding Ippo that he needs to get used to the idea of being aimed at instead of being the underling. Takamura, Aoki, and Kimura hassle Ippo over his newfound status before clowning around on their own so Kumi can move in for some time with the champ. 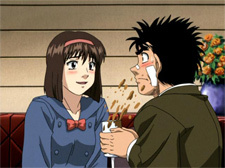 Ippo, smooth as ever, accepts a gift from Kumi nervously but still can’t work up the nerve to try to be more than friends with the love-struck woman in his life. Then again, with Kumi’s older brother Ryo Mashiba being known in the ring as the “Executioner,” I guess we can’t blame the spineless champion too much. Training back at the gym the next day, Coach Genji gets some disturbing news from his old friend Neko. Dankichi Hama, a former boxer from Genji’s fighting days, has returned to Japan. Back when he fought the Chief, Dankichi had a special boxing punch known as the “Flying Swallow.” A difficult throw to predict and block, Genji’s wins over Dankichi were more of a fight for his life than a testament to the Chief’s skill as a boxer. Just then Dankichi enters the training facility to challenge the Chief in a new way. Dankichi has become the trainer of a a former Junior Featherweight champion named Kazuki Sanada. Kazuki Sanada is a medical school student training to become a doctor who also has a talent for boxing in the ring. His knowledge of the human body lets him abuse an opponent clinically to win a match. And now, with Dankichi as his trainer, Sanada has gained the former boxer’s special move, the “Flying Swallow,” and a new version called the “Flying Swallow Flip.” Ippo’s first title defense match is going to be a hard road. As Ippo trains to find a way to predict the “Flying Swallow,” the usual gang of Takamura, Aoki, and Kimura tease Ippo rentlessly over who his would-be girlfriend Kumi might cheer for. As a nurse, Kumi may want to cheer for the up-and-coming doctor rather than her possible boyfriend. The three stooges quickly decide that Ippo’s only choice is to confess his love for Kumi. As expected, Ippo doesn’t want to and tries to resist as the boys run to find a phone. Ippo agrees to call Kumi, but only if someone can beat him in a 3-to-1 wrestling match. Ippo takes out Kimura and Aoki easily which leaves Takamura worried that his stand-in may not be able to beat Ippo in the last round. Naturally, Takamura helps the stand-in have an accident and steps up himself to take on Ippo’s massive arms. The pair square off and don’t budge very far as the table wavers beneath them. 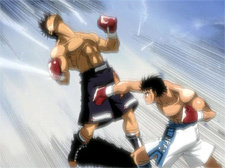 As the table gives out to the pressure, the two boxers fall to the floor, leaving Ippo pinned. 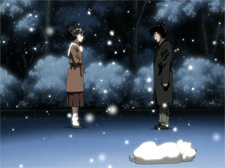 A nice dinner and a walk in the park give Kumi and Ippo some alone time on a snowy night. Takamura, Aoki, and Kimura decide to follow the couple and hide in some bushes at the park to see if Ippo is man enough to finally confess his love to Kumi. As he tries to reveal his deep-but-very-obvious secret, Ippo avoids telling Kumi his feelings by saying that she is free to cheer on either boxer at his defense match. Pissed off at his news, she leaves the idiot standing in the snow. With nothing else to focus on in his life now, Ippo doubles his efforts to prepare himself for his first defense match. Fighting Spirit: Champion Road is everything that is right with the underdog-becomes-champ story Rocky perfected over the years. 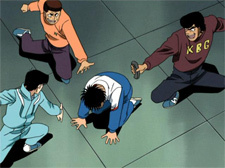 The characters balance serious and silly moments as Ippo prepares for his first defense match. However, it is in the ring where the show truly shines. For thirty-six glorious minutes you can live every moment of Ippo and Sanada’s six rounds as Ippo struggles to take on an opponent’s style he has never fought before. The animation is fluid and draws in the viewer to cheer as you approach the last moments of the special. Both Japanese and English casts give great performances which round out the end of Ippo’s journey in the series for now. Fighting Spirit: Champion Road is a solid title and a must have for any boxing fan. Viewers who haven’t had a chance to catch the TV series can follow most of the story in Champion Road with some useful flashbacks presented early on in the TV Special. Fighting Spirit carries a good subtitle script, fairly accurate dub script, and a good cast on each track to enjoy. The video shows a little artifacting briefly in spots, but nothing very noticable unless you look for those kind of things. The opening and closing are presented in their original Japanese form with no translation available on the DVD screener. Other than this, the title is fairly flawless and a welcome addition to any collection. Whether you love boxing, the Rocky films (not counting V), or have been curious about Fighting Spirit, you should do yourself a favor and check out Fighting Spirit: Champion Road.